The muskmelons that go for hundreds of dollars exists in Japan. If you go to a fancy restaurant, like Sukiyabashi Jiro, you may get it for dessert. I should say, if you are lucky and have a nice friend who treats you to dinner at Sukiyabashi Jiro. The muskmelon is amazing. Aromatic, juicy, and tender, and the most amazing piece of fruit that I have ever had. But, it is possible to try a few bites of the infamous melon without breaking your wallet. 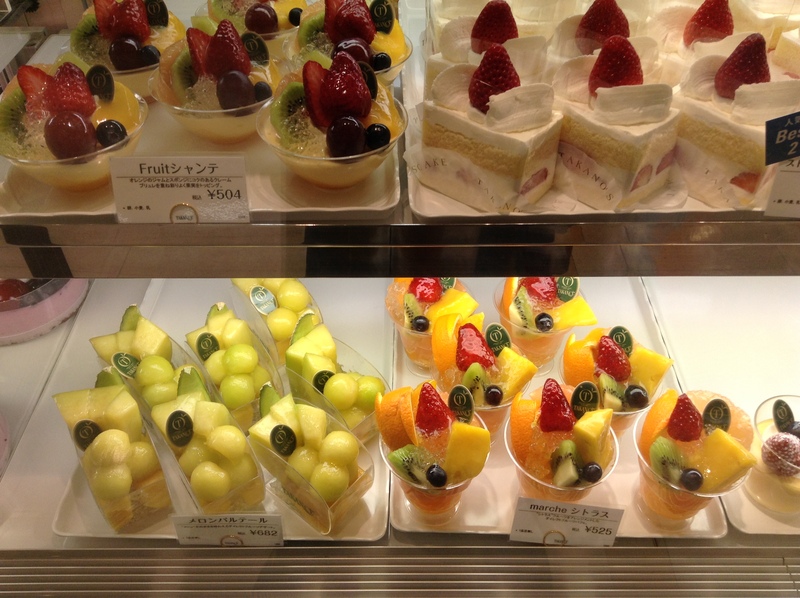 Check out the fruit dessert counter at any depachika. Cakes, tarts, and much more topped with pristine, blemish-free fruit cut into bite-size pieces. The muskmelon balls are above. More muskmelon, figs, and grapefruit. Marron, mango, apple pie, and more. Top left is the Mont Blanc made with chestnuts. 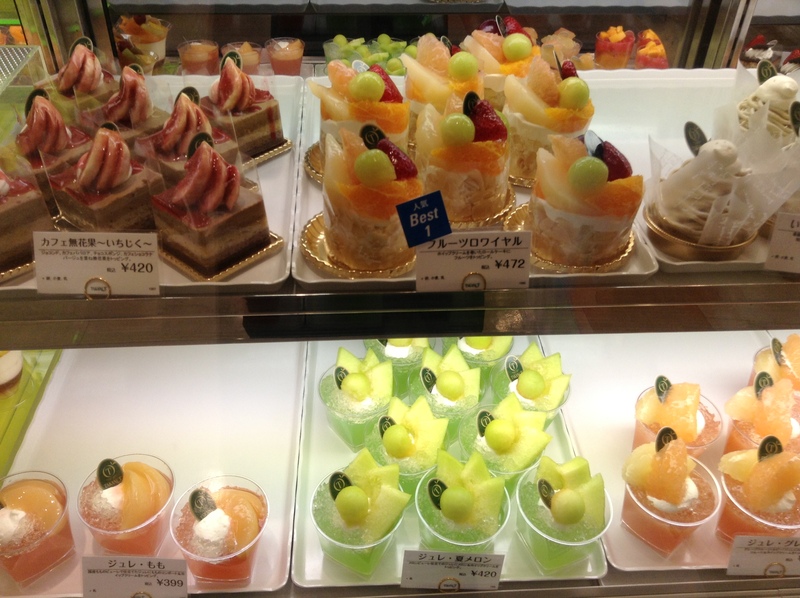 Some department stores have small eat-in counters in the depachika to have a glass of fresh juice or a slice of melon. 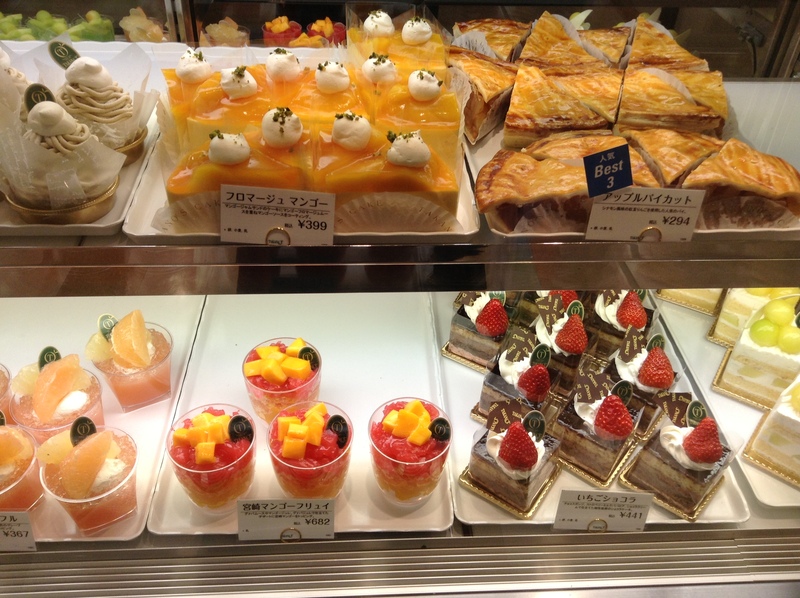 Or, some shops, like Shinjuku Takashimaya, have a larger café on an upper floor. Takano Fruit Café in Shinjuku Takashimaya. 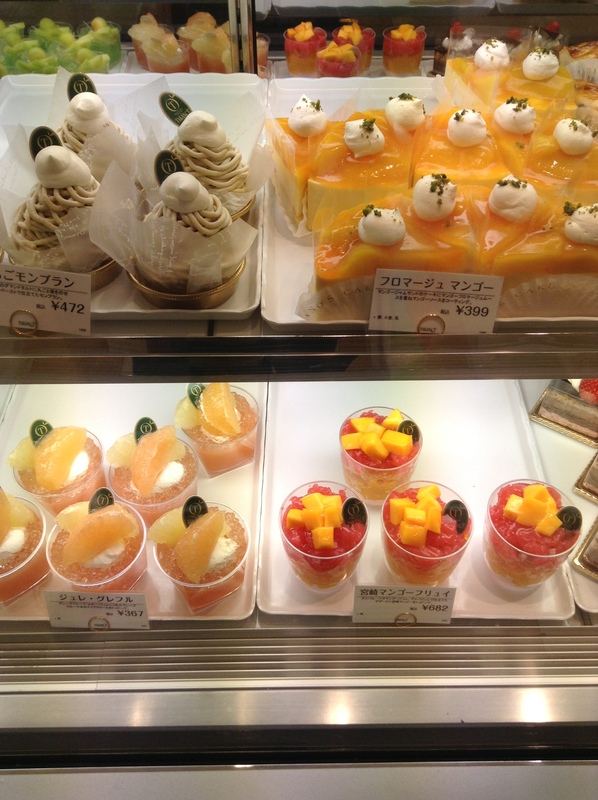 Some famous fruit shops include Sembikiya, Takano, and Lemon. My favorite depachika in Tokyo. Each spring cherry trees around Tokyo blossom while friends, families, and co-workers gather under the blossoms to enjoy the ritual of hanami. 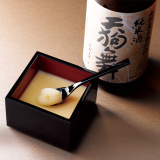 If you are lucky to be in Tokyo this week, it is the quintessential Japanese experience. 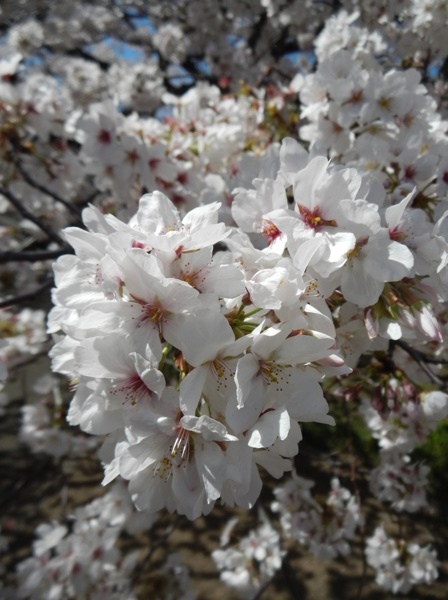 A few tips on how to best enjoy hanami. Most essential is to pick up a bentō. The best place to select from a wide variety of bentō is depachika, the epicurean basement food floors of department stores. Here is my list of the top ten depachika in Tokyo. 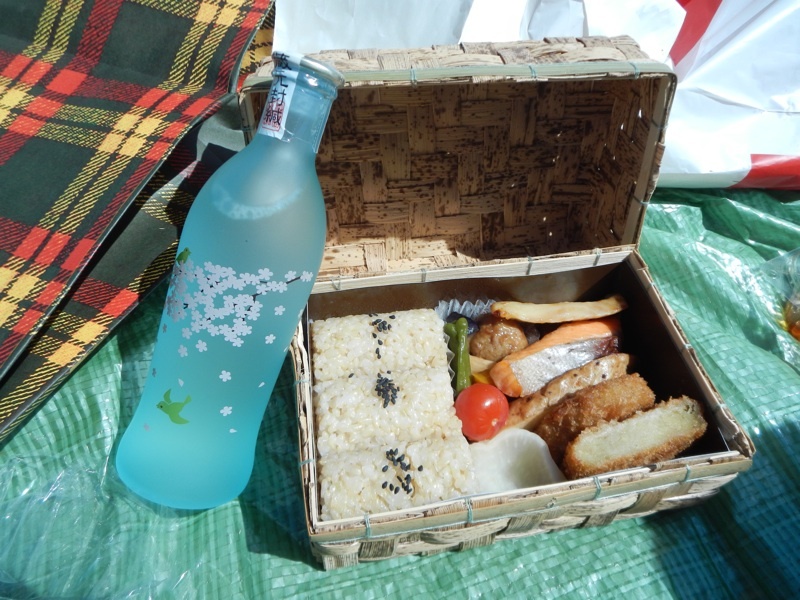 But, if a depachika is not on your way to the park, no worries, a convenient store will have lunch boxes or sandwiches, chips, and other snacks. The bentō above comes from AEN at Shinjuku Isetan, which came in a beautiful bamboo box and had genmai (brown rice) with two types of grilled fish, croquette, pickles, and more. The saké is a junmai ginjō from Shoutoku in Fushimi, Kyoto. It was only 12% alcohol, lighter than most saké which is about 16%, so perfect with lunch. And, I couldn’t resist the packaging. Another bentō company I love and can’t get enough of is Yonehachi, which has branches in almost every depachika. Yonehachi is famous for its okowa, a mix of mochi-gomé (sticky rice) and uruchimai (regular rice) that is steamed with different vegetables and meat or fish. You can select what kind of seasoned rice you want with your bentō. This one here has takénoko (bamboo shoots) and fuki (a type of spring mountain vegetable), both seasonal spring vegetables. Yonehachi bentō, again, as it is my favorite. This one with the takénoko and fuki rice and the kuri (chestnuts) and red beans okowa. The saké with this bentō is from Masumi, a great saké brewery in Nagano. Masumi has an excellent portfolio of saké, including this junmaishu Okuden Kanzukuri. This saké is light on the palate and perfect for sipping under the cherry blossoms. I’ve also had this warmed up and it is lovely hot or cold. Once you’ve picked your bentō and drink, stop by a convenience store to get a plastic sheet to sit on. For some reason these are usually blue. And, then get to your hanami spot early as the choice spots tend to be taken early in the day. Be sure to do some research on where to go. I was surprised to see that Shinjuku Gyoen doesn’t allow alcohol to be brought in. There are security guards who check your bag on your way in. Guards are walking throughout the park as well to make sure everyone is abiding by the rules. 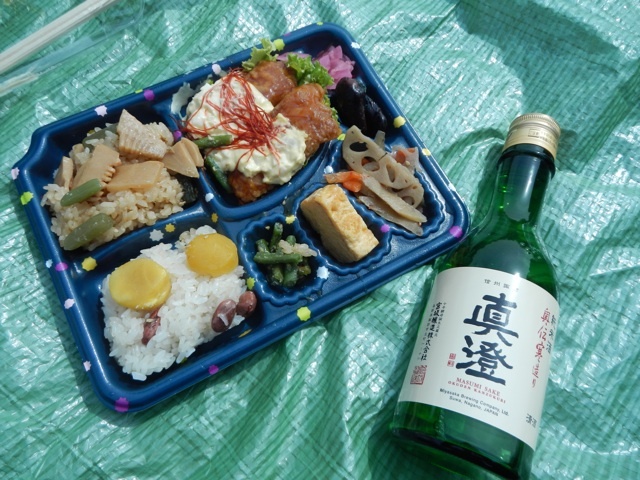 Enjoy and have fun enjoying food food and saké under the cherry blossoms. 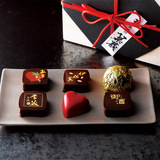 If you are traveling to Tokyo between now and February 14th, be sure to stop by a department store to check out all of the chocolates that are for sale. Valentine’s Day in Japan is done like nowhere else in the world. Chocolate is given from women to the men in their lives. Not only to your boyfriend or partner, but to colleagues at work, family members, and good friends. This being Japan, gift-giving is not a one-way street. Men return the favor to the women in their lives a month later on March 14th, White Day. 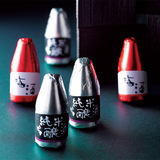 However, the okaeshi, or return gift, is typically white chocolate. There is a good reason for that. No re-gifting. 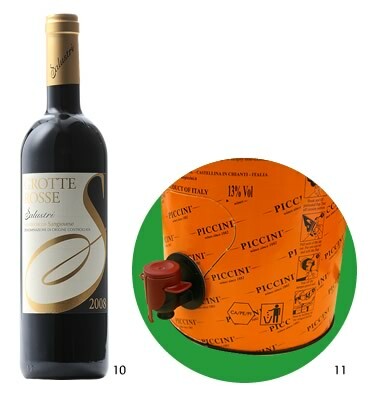 Also, it was interesting for me to see that on White Day, many of the older men who were returning gifts often bought much nicer presents, such as wine. Working at Takashimaya for two years I was able to observe the retail side of this tradition. First of all, my colleagues were surprised to hear that it is only in Japan that this is done. Most of them would laugh at themselves and say how brilliant the chocolate companies are to sell so much chocolate during a holiday that isn’t even Japanese. Most department stores attract customers to their stores by offering unique chocolates that are only available at their shop. 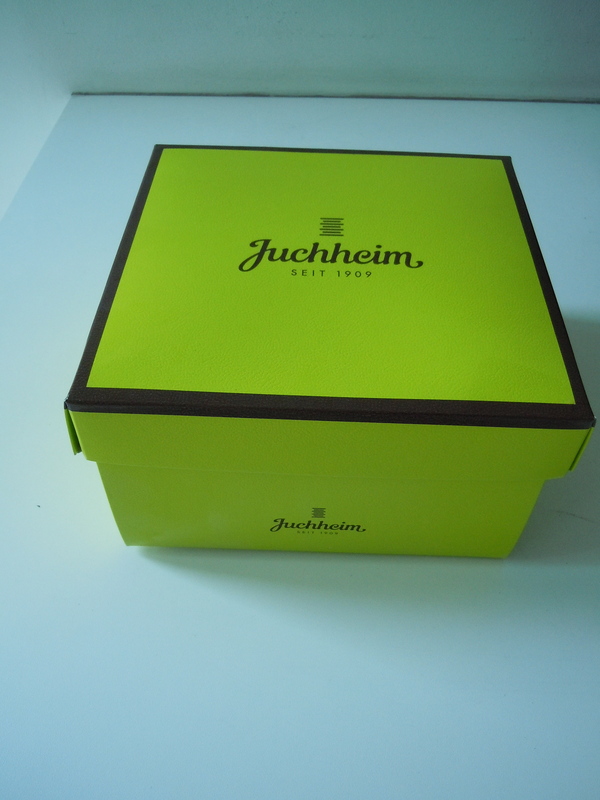 Each year the offerings vary as do the chocolatiers who are invited to create special boxes of chocolates. This year, Takashimaya’s offerings include chocolates from Japanese chefs like Sadaharu Aoki, who currently has a great program on NHK on making French pastries at home. Of course, world-famous chefs like Pierre Herme, Michel Chaudun, and Pierre Marcolini. I am always attracted to any that involve any type of alcohol like the three in the photos above. Most of these unique sweets are only available this time of year. And, it is no secret that some of the chocolates that are sold this time of year is by women buying for themselves. Department stores will hold these chocolate fairs usually the first two weeks in February. If you are near any department store, stop by the concierge on the first floor to inquire into the chocolate events. Most often they are held on the special event floor, but some are held in the depachika as well. Nihonbashi Takashimaya starts on Saturday, February 2nd. Shinjuku Takashimaya starts on Friday, February 1. 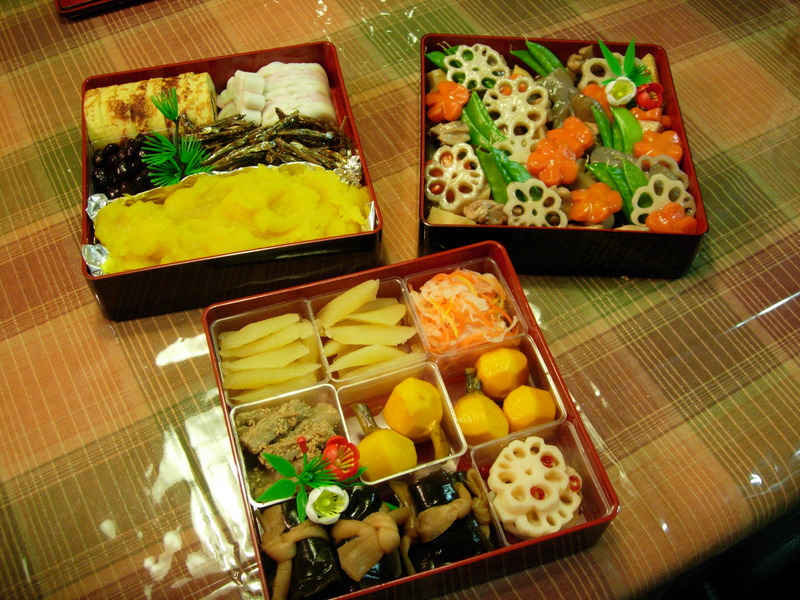 Osechi ryori is food made to eat the first days of the New Year. The photo above is of osechi ryori I made two years ago (I made most of it, I am still not confident to make kuromame). Kazunoko (herring roe) – tiny yellow fish eggs. Like the tobiko often find at sushi restaurants, kazunoko have a bite or crunch to them, however, the eggs are not loose. They are marinated in a broth of dashi, sake and soy sauce. 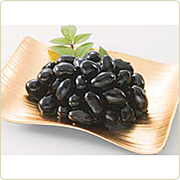 Kuromame (black beans) are soft and quite sweet, although you may notice a bit of soy sauce flavoring. Gomame (also known as tazukuri) are small sardines that have been dried and then finished in a sweet sauce of sugar, mirin, soy sauce and sake. These are rich in calcium and yes, you can eat the head. Kobumaki are nothing more than the umami-rich kombu rolled tightly and bound shut with a ribbon of gourd strip (kampyo). Often kobumaki are stuffed with salmon. This is also cooked slowly in dashi, mirin, sugar, and soy sauce. Datemaki looks like the tamagoyaki (egg custard) you often find in a bento box, but here it’s made with a fish paste and has a sponge-like texture. It’s quite sweet. Sweet potatoes and chestnuts are the base of kurikinton, which can look something like yellow mashed potatoes. 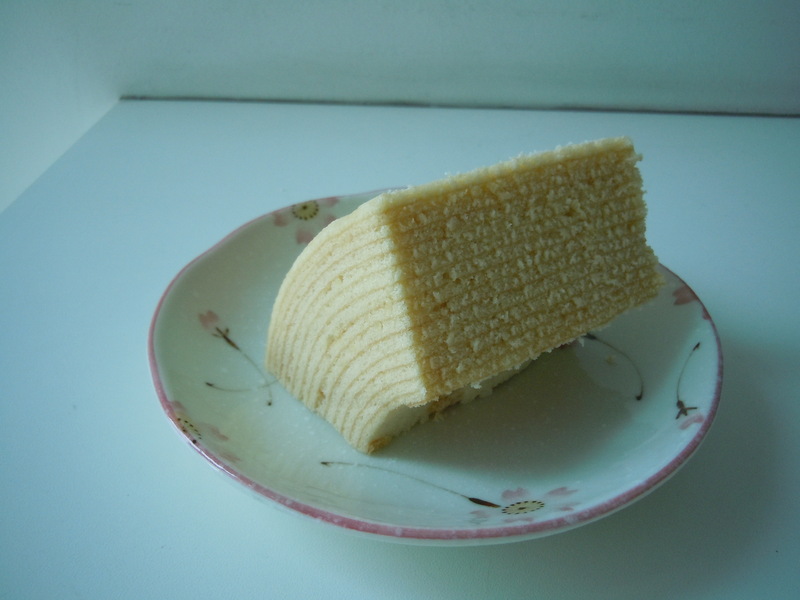 Kamaboko, a dense cake of fish paste, is red and white (traditional New Year’s colors). You can often find thin slices of this on your soba. Another red-and-white food you’ll find is called namasu – typically daikon and carrots pickled in vinegar. For vegetables, look for gobo (burdock root), often dressed with sesame. Also lotus root, carrots, shiitake mushrooms and pea pods. 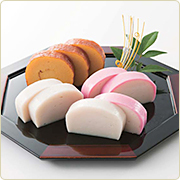 Konnyaku (devil’s-tongue starch) and fu (wheat gluten) will also be sprinkled throughout the stacked boxes. For seafood, shrimp (representing long life) and sea bream (for auspicious fortune) are most typical. 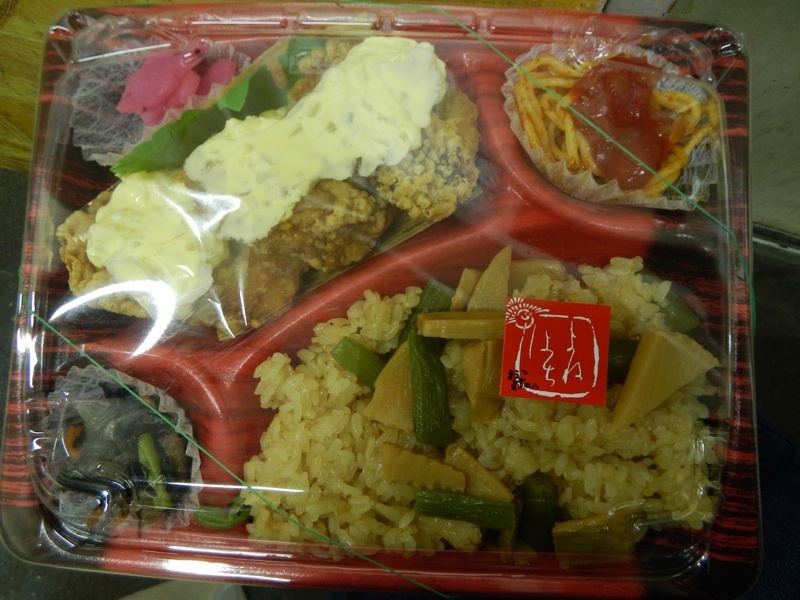 This time of year all depachika will sell a variety of osechi ryori that can be ordered ahead of time. Some are simple bento boxes with just the basics. Famous ryotei will make a limited number of stacked boxes filled with premium ingredients. Some of these can go for hundreds of dollars. This photo below is Takashimaya’s Tokusen Wafu Osechi featuring items from famous purveyors from throughout Japan. 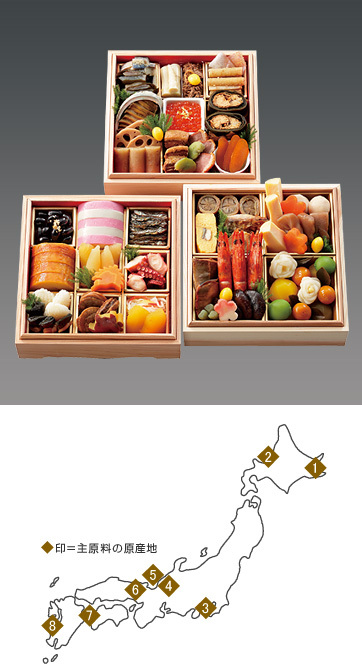 This year Takashimaya is also featuring osechi ryori from famous ryokan in Iwate, Miyagi, and Fukushima. Click here to see photos of these sets. If you are in Tokyo, check out the osechi ryori displays, if not in the depachika then on the event floor (usually the top floor) of the department store. If you are keen on putting together your own osechi ryori then check out the depachika for ingredients or components to assemble your own. Suzuhiro has been making kamaboko for 170 years in Odawara, Kanagawa. When I worked at Takashimaya the Suzuhiro shop was directly in front of the sake shop. It was swamped this time of year with customers picking up kamaboko. Kuromame for me is one of the hardest items to make well and so is better bought. This kuromame is from Nihonbashi Kanmo, a shop famous for its hanpen. Kurikinton is always the first component to go in our house. It is hard to resist the chestnuts. Marujin is in the historic shitamachi district of Shibamata. If you are picking up osechi ryori, be sure to pick up a bottle of sake. Now through Monday, October 10th, at Nihonbashi Takashimaya on the 8th floor, is a great Hokkaido Food Festival. Highlights include pop-up restaurants serving sushi from Hokkaido seafood like ikura, uni, and crab, local ramen, and grilled pork over rice. Lots of sweets, seafood, and cheese. Check out this promotional flyer for photos of some of the many foods for sale. The event ends at 6 p.m. on Monday, which is a national holiday. Now through Monday, October 10th, at Shinjuku Isetan on the 6th floor, is a food festival promoting the great food and wine of Tuscany. 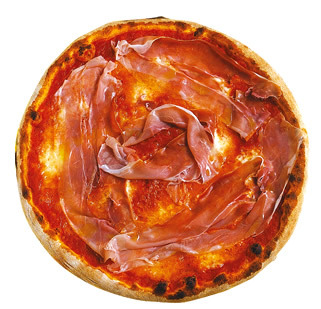 From pizza to gelato to wine, there is a wide variety of products available. Note that the event ends at 6 p.m. on Monday. August is when the gardens are overflowing. Look for these vegetables when dining out. 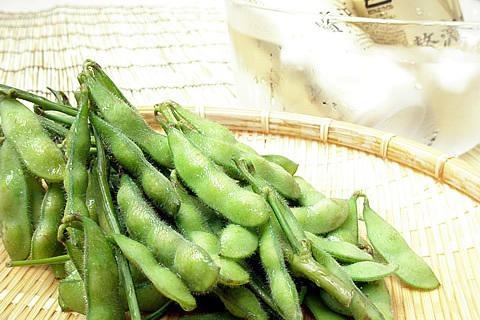 Edamame at beer gardens, vegetables in bento at depachika, and in the supermarket. One of my favorite shops at depachika for inspiration on Japanese vegetables is RF1. It is located in most depachika and is a deli with a wide variety of dishes that incorporate a cornucopia of vegetables.